Nomad Factory Drum Tools on promo for ONLY $49! Nomad Factory’s Drum Tools can get you a ‘Killer Drum’ sound right away. And until the 31st of August you can get it for only $49 instead of the $179 List price. If you want to have a successful mix out today, your Drum sounds had better sound amazing, punchy, have clarity, and sit “in the mix!” Nomad Factory’s Drum Tools was made exactly for that purpose, to give your Drums a powerful/modern sound. Drum Tools includes all the Nomad Factory trademark effects; Gate, Expander, Compressor, Convolution Reverb, High Pass, Low Pass Filters and amazingly well Tuned EQs and Kit Piece reference presets. 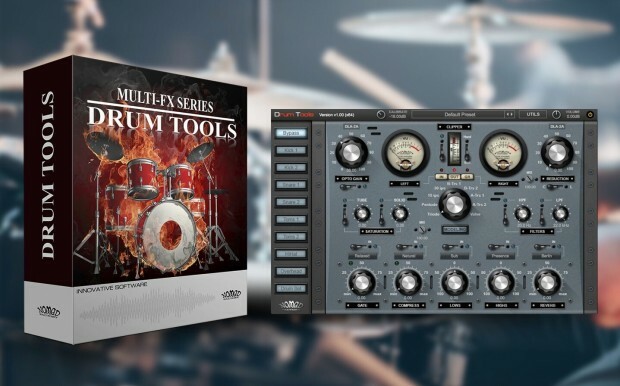 Drum Tools gives you the means to “Mix your Drums to perfection!”. Our good friend Jerry Mateo from In The DAW has produed a great video for you to learn more about the exciting features of Drum Tools. Check it out below! This entry was posted in DontCrack, Plug-ins, Promotions and tagged Compressor, Convolution Reverb, Drum Tools, Drums, EQ, Equaliser, Expander, High Pass Filters, Low Pass Filters, Nomad Factory. Bookmark the permalink.